This 2-CD set is a bit of a mystery. It is NOT a collection of soundtrack music from "Half Human". Instead, it is a straight recording of the entire film from beginning to end, including music, dialogue and sound effects. As a result, the sound quality leaves a lot to be desired, which is not surprising for a film released in 1955. The question is, why does this CD even exist? My guess is because of the unavailability of the film itself. "Half Human", known as "Monster Snowman" in Japan, was Ishiro Honda's second attempt at directing a monster film, after the first "Godzilla". 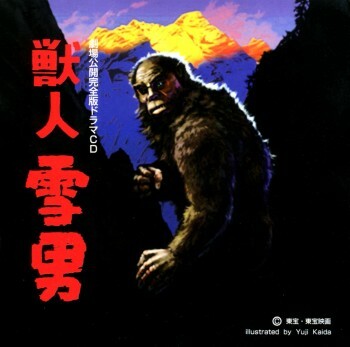 The movie itself was a dark story involving scientists searching for the missing link, and their encounter with native villagers and an abominable snowman-like creature and its son. The original Japanese version of the film is said to be one of Honda's best, but it has been out of circulation for years and has never been available on video. Reportedly, Toho Studios feared that the film's unsympathetic and stereotypical depiction of the natives would today be considered offensive to the Ainu, one of the original native tribes of Japan who were persecuted for centuries and eventually pushed north to Hokkaido. Like their Native American counterparts, the surviving Ainu people eventually won sympathy and respect in Japan, so the banning of "Half Human" is apparently a result of Japanese society's sensitivity to the Ainu cause. 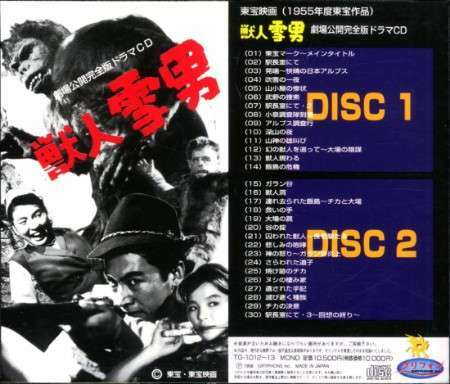 This CD is probably the only way to experience the narrative of the original Japanese film today (the butchered American version is a poor substitute). Unfortunately, the recording offers little to listeners who don't understand Japanese, so I would only recommend it to completists. Fans of Masaru Satoh's score would be much better off finding a copy of the far superior-sounding original soundtrack, released in 1997 on Futureland (TYCY-5509).